This is a digi stamp from "From The Heart Stamps". Sadly the storefront has closed so this stamp is unavailable. This is super cute, Doni. What a darling little image. I'd love to haveyou play along with us at Word Art Wednesday any time you' can. We have awesome prizes, and our challenges are always Anything Goes/Family Friendly. I hope you'll join us. OMG this is so cute Doni! GREAT JOB!!! Love the design! Doni... your surfing chick is priceless! Love your coloring! Thanks so much for joining us at The Paper Players this week! 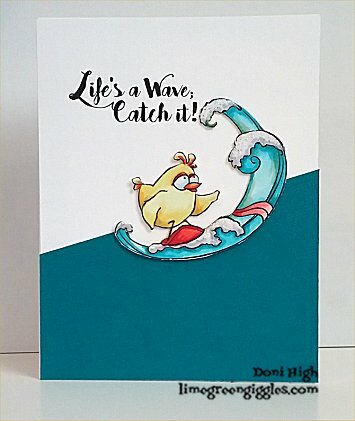 What a fun surfing Birdbrain and perfect for our sports-themed CAS challenge! Thanks for sharing over at The Paper Players! Doni your surfing chick is adorable - I can almost feel the movement of your waves! A fabulous CAS sports-themed card. Thanks for joining us over at The Paper Players this week! So cute...adorable image, wonderful coloring and nice, clean and simple! Thanks for sharing this cutie with us at the Paper Players!